True employee engagement occurs when individuals apply the full measure of their creative energy and talent to performing work that wholly supports achievement of the organization’s goals. 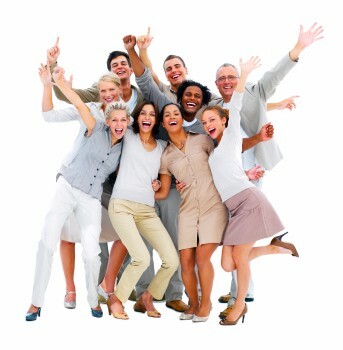 And while perfect engagement is not achievable, our experience and the Gallup Organization’s research reveal that a clear, forward-looking strategy aligned with the organization’s vision, values, and mission goals and translatable to the day-to-day activities of all organization members combined with inspiring leadership is absolutely essential to maximizing employee engagement. Management and Leadership: People join companies and they leave managers. Leaders are therefore central to the engagement and retention of the employees under their charge and throughout the organization. These individuals set the tone and the standards for the way in which all organization members behave and interact; truly determining whether or not employees will give the fullest of their time, talent, and energy to the success of the company. Diversity and Inclusion: Diversity and inclusion exists when members of an organization act in a manner that recognizes and respects individual similarities and differences such that employees feel they and their work are valued and meaningfully contribute to the mission of the organization. Only when an organization’s culture – its collectively shared values and beliefs – embraces diversity and acts inclusively of all employees will true engagement be realized. Gallup Organization research reveals that organizations with world-class employee engagement are 18 percent more productive and 12 percent more profitable than industry competitors with bottom quartile performance! In fact, top decile companies realize 3.9 times the Earnings Per Share (EPS) growth rate compared with low engagement performers within their industry. 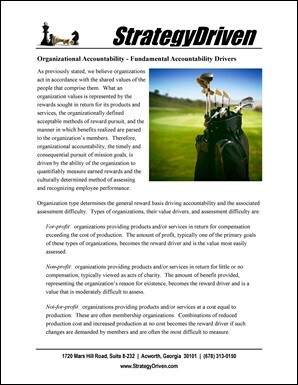 Organizational Accountability: Organizational accountability exists when all members of the workforce individually and collectively act to consequentially promote the timely accomplishment of the organization’s mission. Through organizational accountability, employee actions are aligned to the optimal achievement of the organization’s vision, values, and mission goals. Decision-Making: An individual’s decisions reflect his or her beliefs and values. Therefore, credibility of the organization’s vision, values, and mission goals depends largely on the management decisions exemplifying these principles. Maintaining credibility requires strong principles-based reinforcement particularly when decisions affect cost, production, and schedule. When management’s decisions consistently reinforce the organization’s vision, values, and mission goals, employees will also actively engage to achieve these objectives. When decisions place cost, production, schedule, or ambition serving goals ahead of the organization, employees will become cynical and commitment and engagement will wane. Business Strategy: A clear, forward-looking strategy, translatable to the day-to-day activities of all organization members, is critical to realizing success in today’s fast paced market environment. Not only does a compelling, well executed strategy align and engage individuals to a common purpose, it ensures that purpose best serves the organization’s vision, values, and mission goals. The Cost of Not Engaging Employees explores the cost of not engaging employees; revealing why this business imperative can have as significant a return on investment as most other strategic initiatives. How to Better Engage Employees explores the actions executives and managers can take to better engage their employees; revealing how to improve employee satisfaction, productivity, retention, and ultimately the bottom line. The Warning Signs of Employee Disenfranchisement explores the warning signs of employee disenfranchisement; indicators that lost productivity, contribution and rising attrition may be eminent. Retaining Your Best Employees explores how to create a workplace environment that retains its best employees and simultaneously improves productivity. Identify the Hidden Drivers, part 1 of 3 identifies what hidden performance drivers are, examines the often unintended impact of hidden drivers on an organization, and explores examples of documented hidden drivers. Identify the Hidden Drivers, part 2 of 3 explores examples of undocumented hidden drivers and their frequent relationship to an organization’s culture and history as well as the personal ambitions of its employees. Identify the Hidden Drivers, part 3 of 3 identifies ten questions to explore when seeking to identify both documented and undocumented hidden performance drivers and recaps the key concepts presented in the hidden drivers trilogy. What is Diversity and Inclusion? 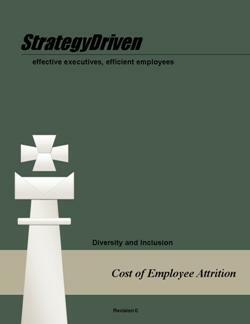 explores the characteristics and benefits of a diverse and inclusive organization. Employee Engagement: Untapped bottom line potential explores the principle components of employee engagement, mechanisms for achieving it, and quantifiable benefits realized over those not so well engaged. An Interview with Diana McLain Smith, author of Divide or Conquer: How Great Teams Turn Conflict into Strength explores the relationship challenges that can hinder optimal team performance and how to overcome them. An Interview with Tony Simons, author of The Integrity Dividend: Leading by the Power of Your Word, part 1 of 2 examines three personal alignment mechanisms and their impact on an organization’s overall performance. An Interview with Tony Simons, author of The Integrity Dividend: Leading by the Power of Your Word, part 2 of 2 examines three personal alignment mechanisms and their impact on an organization’s overall performance. An Interview with Roxanne Emmerich, author of Thank God It’s Monday! explores how to create a workplace environment that engages the hearts and minds of employees and customers; resulting in increased growth and higher profits. An Interview with Omar Khan, author of Liberating Passion examines how executives and managers can liberate their organization’s passion; tapping into the workforce’s inner energy and commitment to deliver breakthrough results. An Interview with Ken Blanchard, author of Leading at a Higher Level examines how world-class leaders create a compelling vision; ensuring their employees know who the leader is, where they are going, and the values that will guide the journey. An Interview with Dave Esler, co-author of The Pursuit of Something Better, part 1 of 2 examines how U.S. Cellular achieved superior results by becoming a Dynamic Organization, a transformational change that focused the organization on the customer and on valuing its front line associates. An Interview with Dave Esler, co-author of The Pursuit of Something Better, part 2 of 2 examines how U.S. Cellular achieved superior results by becoming a Dynamic Organization, a transformational change that focused the organization on the customer and on valuing its front line associates. StrategyDriven Podcast Special Edition 40a – An Interview with Frank McIntosh, author of The Relational Leader, part 1 of 2 examines how a people-centered relational leadership approach breaks down organizational barriers and engages and motivates employees for achievement of truly superior results. StrategyDriven Podcast Special Edition 40b – An Interview with Frank McIntosh, author of The Relational Leader, part 2 of 2 examines how a people-centered relational leadership approach breaks down organizational barriers and engages and motivates employees for achievement of truly superior results. 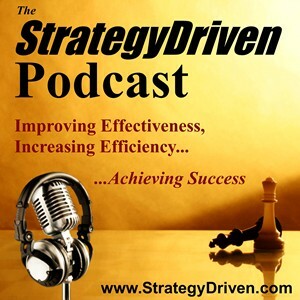 StrategyDriven Podcast Special Edition 41 – An Interview with Susan Bagyura, author of The Visionary Leader explores how to lead one’s employees to have a success-focused mindset and then translate that mindset into the actions that will not only move the organization forward but also help it achieve greater levels of success. StrategyDriven Podcast Special Edition 43a – An Interview with Diane Katz, author of Win at Work!, part 1 of 2 examines how to deal with workplace conflict in a non-confrontational manner that enables everyone involved to win and the organization to function more productively. StrategyDriven Podcast Special Edition 43b – An Interview with Diane Katz, author of Win at Work!, part 1 of 2 examines how to deal with workplace conflict in a non-confrontational manner that enables everyone involved to win and the organization to function more productively. An Interview with Steve Kerr, author of Reward Systems examines how properly conceived and implemented reward systems create organizational alignment and increase execution efficiency and effectiveness. An Interview with Garry Ridge, co-author of Helping People Win at Work explores the Partnering for Performance management system and how it engages employees to assess and improve their performance to unprecedented levels. An Interview with Nilofer Merchant, author of The New How explores the transformation of the traditional, top-down approach to strategy planning and execution into a collaborative process proven to be significantly more effective. Relational Leadership: Attracting and Retaining Top Talent, part 1 of 2 explores how to attract talented personnel and reduce the undesired attrition of top employees through development of a positive, reinforcing workplace environment where people feel they are valued and have the opportunity to grow. Relational Leadership: Attracting and Retaining Top Talent, part 2 of 2 concludes our discussion on how to attract talented personnel and reduce the undesired attrition of top employees through development of a positive, reinforcing workplace environment where people feel they are valued and have the opportunity to grow. Relational Leadership: The Building Blocks of Trust, part 1 of 2 explores how to establish and maintain trust between an organization’s executives, managers, and employees – the foundation without which no organization can be truly successful. Relational Leadership: The Building Blocks of Trust, part 2 of 2 concludes our discussion on how to establish and maintain trust between an organization’s executives, managers, and employees – the foundation without which no organization can be truly successful. Developing a Collaborative, Productive Culture examines how leaders can develop a collaborative, productive culture where conflict is used constructively to better the organization’s overall performance. We are pleased to announce that Michael Lee Stallard has made the electronic version of his book, Fired Up or Burned Out: How to Reignite Your Team’s Passion, Creativity, and Productivity, available for download at no cost to our readers. Simply click on the link above to download your copy of this remarkable book on how to better engage employees; igniting their creativity, imagination, and spirits to the success of the organization. An organization’s leaders set the tone and standards for the way in which all members behave and interact; truly determining whether or not employees will give the fullest of their time, talent, and energy to the success of the company. As well as learning these skills on the job, one can also attend a university or college degree program to acquire these skills. Find out how you can learn management and leadership skills through accredited online universities. Solange Charas joined TalentScope in 2008 as the Global VP of Pre-Sales for the group. Prior to her joining TalentScope, she held several top level HR positions including CHRO of Praetorian Financial Group, SVP, Head of Human Resources for Benfield Group, and Global Head of Human Resources for Havas Advertising. In these roles she was responsible for all aspects of HR for these three organizations. Ms. Charas’ prior professional consulting experience includes many senior-level positions with companies such as Arthur Andersen, Ernst & Young LLP, and Towers Perrin. Ms. Charas served as a chairperson of the Remuneration Committee 2005 to 2009 for NASDAQ-traded Able Energy. Lisa Orrell, The Generation Relations Expert, is an in-demand corporate speaker, consultant, and professional Leadership & Career Coach for Millennials. She is the author of the award-winning book Millennials Incorporated , and her new book, Millennials into Leadership , was just released on Amazon and praised with 5 star reviews. She has also been featured by countless media, such as: MSNBC, ABC, NPR, The NY Times, Wall Street Journal, BNET.com, FoxBusiness.com and Human Resource Executive. For more info about Lisa’s seminars, keynotes, workshops, coaching, and books, visit: www.TheOrrellGroup.com. People also follow Lisa’s insights on Twitter @GenerationsGuru. Diana McLain Smith, author of Divide or Conquer: How Great Teams Turn Conflict into Strength , is a partner at the Monitor Group, a global management consulting firm and founding partner of Action Design, a small firm specializing in organizational learning and professional development. For the past 25 years, Diana has advised leaders and their teams on how to build relationships strong enough to master their toughest challenges. She has taught courses and delivered lectures at the Harvard Law School, the Harvard Graduate School of Education, and Boston College’s Carroll School of Management. To read Diana’s full biography, click here. Tony Simons, author of The Integrity Dividend , is an Associate Professor at Cornell University where he teaches organizational behavior, negotiation, and leadership. Tony is also a business consultant and speaker who focuses on trust in leaders, executive team member trust, and trust in supply chain relationships. To read Tony’s full biography, click here. Michael Gurian, New York Times best selling author of Leadership and the Sexes , is co-founder of the Gurian Institute, a training organization focused on helping corporations, educators, parents, and communities understand of how the male and female brain operate differently. He has spearheaded a national effort to provide communities and corporations with training in brain based gender issues. Michael’s pioneering theory has been featured in leading national media including The New York Times, Washington Post, USA Today, Time, and Newsweek. To read Michael’s full biography, click here. Steve Kerr, author of Reward Systems , is Senior Advisor at Goldman Sachs, where as Chief Learning Officer he created Pine Street, the firm’s distinctive leadership development organization. Prior to joining Goldman Sachs, Steve was the Chief Learning Officer at General Electric, where he led and expanded that organization’s world renowned Crotonville learning center. He has also served on the business school faculties at Ohio State University, the University of Michigan, and the University of Southern California. To read Steve’s full biography, click here. Susan Bloch, co-author of How to Manage in a Flat World , has coached top teams in many of the FTSE100 and Fortune 500 companies across the globe over the past 20 years. She is currently Chief Learning Officer at the Aditya Birla Group. Prior to that she worked at Reliance Industries in the Retail Division, as Chief Culture Officer. Before coming to India she was Partner and Head of Thought Leadership at Whitehead Mann in London where she was operating as an executive coach, working with executive teams and conducting board effectiveness reviews. Previously she was global head of executive coaching for the Hay Group. A Chartered Psychologist, Susan has co-authored, How to Manage in a Flat World , Employability, and Complete Leadership and has produced a number of research publications. Garry Ridge, co-author of Helping People Win at Work , is President and CEO of the WD-40 Company, the San Diego, California based maker of the ever-popular WD-40, as well as the Lava heavy duty hand cleaners, Carpet Fresh, and 2000 Flushes household cleaning products. Garry teaches leadership, talent management, and succession planning at the University of San Diego’s Executive Leadership program and in 2003 was named Director of the Year for Enhancement of Economic Value by the Corporate Directors Forum. A native of Australia, he has served as national Vice President of the Australian Institute and the Australian Automotive Aftermarket Association. To read Garry’s full biography, click here. Nilofer Merchant, author of The New How , is Chief Executive Officer of Rubicon Consulting, a strategy and marketing consultancy designed specifically to serve the needs of technology companies. Nilofer has honed her unique collaborative approach to solving tough business problems while working with and for companies such as Adobe, Apple, Nokia, and HP. To read Nilofer’s complete biography, click here. Dave Esler, co-author of The Pursuit of Something Better , is a Principal at Esler Kruger Associates, a consulting firm that for more than 20 years has helped organizations and their leaders become more effective. Dave has a corporate background in communications and human resources from Metropolitan Life and Nortel Networks and several years of consulting experience. He is the author of many articles on a variety of business topics. Michael Lee Stallard, author of Fired Up or Burned Out , is co-Founder and President of E Pluribus Partners, a consulting firm specializing in helping leaders create ‘Connection Cultures’ to form strong bonds among the management, employees, and customers of an organization. Michael’s work has been featured in The Wall Street Journal, The New York Times, Leader to Leader, Human Resource Executive, and Fox Business Now. He has spoken at conferences organized by The Conference Board, GE, Google, NASA, Johnson & Johnson and Yale-New Haven Hospital. To read Michael’s full biography, click here. Frank McIntosh is author of The Relational Leader . During his 36 year career, Frank has worked with many of the most recognized companies and executives in the world. He has provided consulting services for peers across the country and helped initiate Junior Achievement programs in Ireland, the Ivory Coast, Oman, the United Arab Emirates, Bahrain, and Uzbekistan. Frank was inducted into the Delaware Business Leaders Hall of Fame in October 2008, one of 38 individuals so honored and the first not-for-profit executive to receive this distinction in Delaware’s 300 year business history. To read Frank’s complete biography, click here. Susan Bagyura is author of The Visionary Leader . With over twenty-five years of sales, marketing, and entrepreneurial experience, Susan works with clients to attract, motivate and develop their employees, starting with the leadership team and then going throughout the organization. Her coaching and consulting practice is centered on helping small businesses grow by increasing sales and profits, improving communications, and reducing staff attrition. To read Susan’s complete biography, click here. Diane Katz is author of Win at Work! and President of The Working Circle, a management consultancy providing organizational development, human resources, and team building training and coaching. For over 15 years, Diane has helped executives and managers in manufacturing, construction, technology, healthcare, government, and nonprofits better deal with workplace conflict using her unique, 8-step non-confrontational method, The Working Circle. To read Diane’s complete biography, click here. Jon Gordon is a consultant, keynote speaker, and the international bestselling author of Soup: A Recipe to Nourish Your Team and Culture , The Energy Bus: 10 Rules to Fuel Your Life, Work, and Team with Positive Energy , The No Complaining Rule: Positive Ways to Deal with Negativity at Work , and Training Camp: What the Best Do Better Than Everyone Else . Jon and his books have been featured on CNN and NBC’s Today show, as well as in Forbes, Fast Company, O, The Oprah Magazine, The Wall Street Journal, and The New York Times. He has worked with such clients as the Atlanta Falcons, the PGA Tour, Northwestern Mutual, JPMorgan Chase, and Publix Supermarkets. To read Jon’s complete biography, click here. Jeff is also a member of the National Speakers Association and a regular speaker on the topics of retention, recruiting and leadership. To read Jeff’s complete biography, click here. Helanie Scott has driven stunning leadership and cultural transformations for an impressive list of organizations including: Dr. Pepper, Reuters, Fluor, Ericsson, PepsiCo and more. Raised in a small, South African mining town, by the age of 21 Helanie had set out on her own in Johannesburg, learned the ropes of the big city, and purchased the business that hired her. She emigrated to Canada and then to the United States, researching and studying leadership and organizational development, and growing her Align4Profit consulting firm. To learn more about Helanie, click here. Julie Bowen is a freelance writer and full-time mom. After graduating college, she put a lot of effort into her career as a businesswoman with several successful enterprises, but when motherhood came along, she decided it was time to pull back and take up her other passion, writing. Now she writes about business and finance and finds her work-life balance far more enjoyable. When not working and caring for her children, she likes to go for long walks with her dogs, though she is considering using Rollerblades so they can pull her.